Commuters and visitors to the capital city may catch a different glimpse of James Bond as they travel on the London Underground this month. Ian Fleming Publications have launched a new poster campaign at Tube stations to promote the release of the '007 Reloaded' audiobooks. 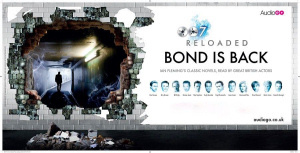 Other Bond posters appearing across London include Sony Pictures' publicity for "Skyfall" and a product tie-in poster from Omega.